Pockets is a VISA powered Universal payment wallet By Which You Can Make Online Payment,Do Any Merchant Transaction Easily. Now ICICI Bank Has Come Up Again With Pockets Card Activation Offer Where You Can Get Free Rs 50 Cashback In Wallet For Applying Pockets Wallet. Follow steps to avail this Offer. 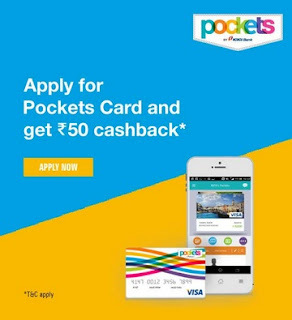 How to get 50 Rs cashback?